Liberty Bridge, one of many Greenville attractions that are fun and totally FREE! Photo by Sherry Boswell, TravelingMom with Teens. Free things to do in Greenville? The secret is out: Greenville, South Carolina is one hustling, bustling Southern city. 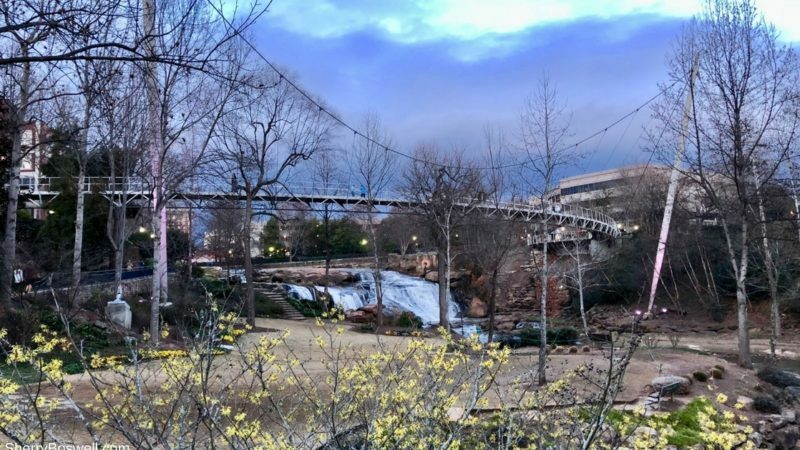 National Geographic Traveler, Conde Nast, and Forbes all have named Greenville as a top notch destination with one of America’s best downtowns. Just as important as a thriving arts scene, fabulous restaurants and shopping, and special events is the concept of FREE. That’s right: free activities and events are vital for a city and gentle on the wallet. Greenville is home to many wonderful attractions that have this perfect price point. Check these 11 free in Greenville activities next time you visit Greenville, SC. 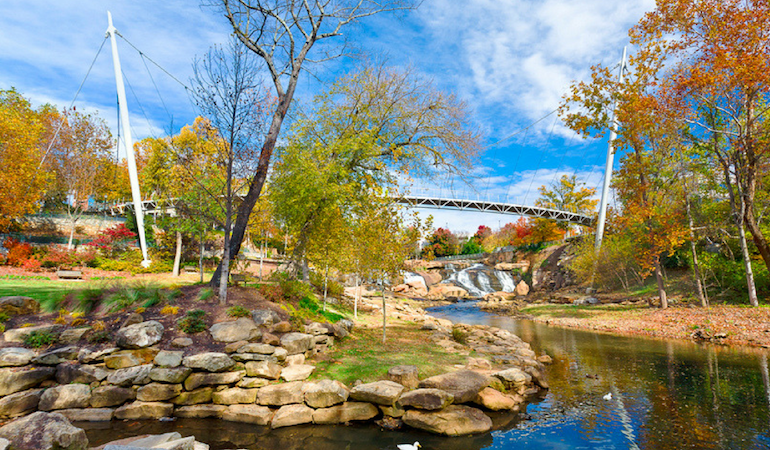 Falls Park is a recreation lover’s dream. Photo Credit: VisitGreenvilleSC/Firewater Photography and Kris Decker. Greenville, SC should be on your radar. It’s one hot travel spot that has garnered rave reviews. But what gets the best review of all is the fact that many of Greenville’s activities and attractions are FREE. 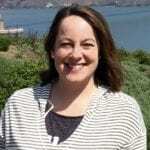 In the words of Austin Powers, “YEAH, BABY!” Come take a virtual tour with TravelingMom with Teens Sherry Boswell as she freely shares her free in Greenville finds in this fabulously fun city. Gorgeous. Jaw-dropping. These adjectives are often used when describing the 32-acre green space in downtown Greenville. Fittingly, there’s a LOT of GREEN with towering trees providing shade and grassy areas beckoning to unpack your picnic. Home to many local events such as Artistphere and Fall for Greenville, the focal point of Falls Park is Liberty Bridge, a 345-foot long pedestrian-only suspension bridge. Spend a little or a lot of time soaking up the sun, exploring, skipping rocks on the river, or sitting on a wrought iron swing. Pack a picnic or partake of one of the many fantastic restaurants within walking distance. Local favorites include Passarelle Bistro (French) , Jianna (modern Italian and oyster bar), Halls Chophouse (steakhouse), Trappe Door (Belgian), or Grill Marks (American burgers and shakes). This free trolley service can save some steps and allow visitors to avoid downtown traffic and parking fees. Service runs Thursdays and Fridays from 6-11 PM, on Saturdays from 10 AM-11 PM, and on Sundays from 1-8 PM. TravelingMom Tip: Park at Greenville County Square, a permanent trolley park-and-ride spot for free and catch the trolley to your favorite downtown destination. Also along the Reedy River is the Children’s Garden at Linky Stone Park. This 1-acre unique garden boasts floral experiences using all five senses, a geology wall made of rocks and minerals from around the Upstate, a textile garden, a Hansel and Gretel cottage, and a secret garden. Love art? Then the Greenville County Museum of Art deserves a visit. Touted as one of the best American art museums in the South, this museum houses the world’s largest public collection of watercolors by iconic American artist Andrew Wyeth. Contemporary artist Jasper Johns also has an impressive collection of paintings and prints on display. Baseball fans will remember Shoeless Joe Jackson for his skill and his involvement on the infamous 1919 Chicago White Sox team accused of betting on the World Series. All were acquitted and yet Shoeless Joe was banned from baseball. Sad statistic was given that he still holds the 3rd all-time best batting average (.356) in baseball history. WOW! Shoeless Joe’s museum is appropriately located across the street from Fluor Field, home of the local Greenville Drive baseball team and a 5,700 seat stadium modeled after Fenway Park. Although baseball tickets are not free, tickets are very reasonably priced and these minor league games are definitely worth checking out. I love the story behind this iconic downtown Greenville scavenger hunt. Mice on Main was the brainchild of Jimmy Ryan as his senior project designed to highlight Greenville’s character and spirit. These nine bronze mouse statues were created by SC native Zan Wells. The mice all have names starting with M: Marvin, Maggie, Marvin Jr., Marcley, Millie, Mitch, Melissa, Aunt Mifflin, and Uncle Miles. Mice on Main is all about Greenville, so it’s only fitting that all proceeds from books, games, and T-shirts are contributed to a Greenville charity. TravelingMom Tip: Choose either the Hyatt Regency or the Westin Poinsett Hotel as starting points, and all the mice are located between these two points. Scavenger hunt tips are available. 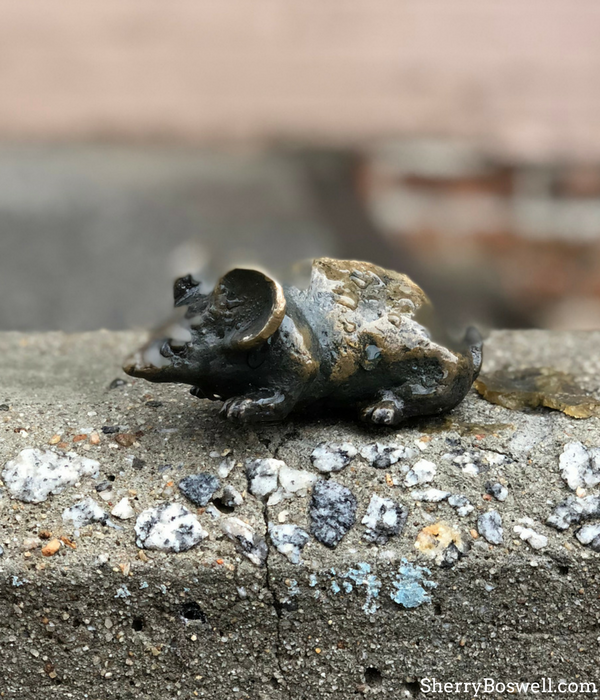 One of the Mice on Main named Marvin Jr. can be found with the following clue: “You’ll see Marvin Jr. at the top of the stairs, where coffee lovers and computer gurus meet and poets love to count their feet.” Photo by TravelingMom with Teens Sherry Boswell. This is my newest FREE find in Greenville, and quite a fun pick! Remember Falls Park? Well, it’s also home to Moonlight Movies that are family friendly and seasonal favorites. Past movie hits include The Princess Bride, Jumanji, The Goonies, Clue, and Jurassic Park. Holiday classics range from Miracle on 34th Street to Beetlejuice for Halloween. Guests are welcome to bring food and beverages, blankets, and lawn chairs and enjoy a classic movie under the stars with the Reedy Falls rushing in the background. 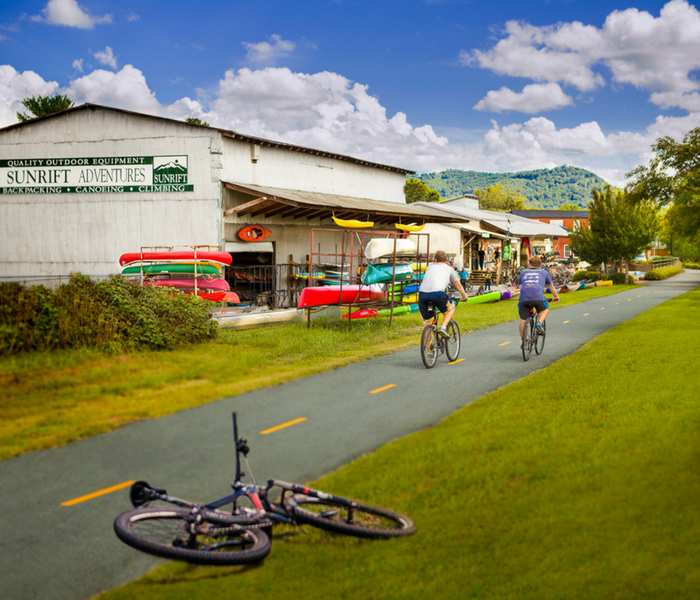 The Swamp Rabbit Trail weaves almost 20 miles from Travelers Rest to the city of Greenville. Photo Credit: VisitGreenvilleSC/Firewater Photography and Kris Decker. Bike riders, rejoice! This walking and biking trail has inspired Greenville natives and visitors to get outside and get active. The Greenville Health System Swamp Rabbit Trail is a 20 mile multi-use (walking & bicycling) greenway network that follows the Reedy River, an old railroad corridor, and city parks. The swamp rabbit has become so iconic in Greenville that the local hockey team is named the Swamp Rabbits. OK, that doesn’t sound like a menacing mascot for a hockey team! This outdoor chapel has stunning mountain views and is a popular wedding venue. Formally named the Fred W. Symmes Chapel, Pretty Place is part of YMCA Camp Greenville. Founded in 1912, Camp Greenville spans 1400 acres. Typically the chapel is booked throughout the day on Saturday and Sunday. For this reason, guests should contact the camp office to check the schedule prior to visiting to avoid conflicts with weddings or other privately scheduled events at Pretty Place. Worth the drive and a stone’s throw from other notable spots like Caesar’s Head and Brevard, NC. 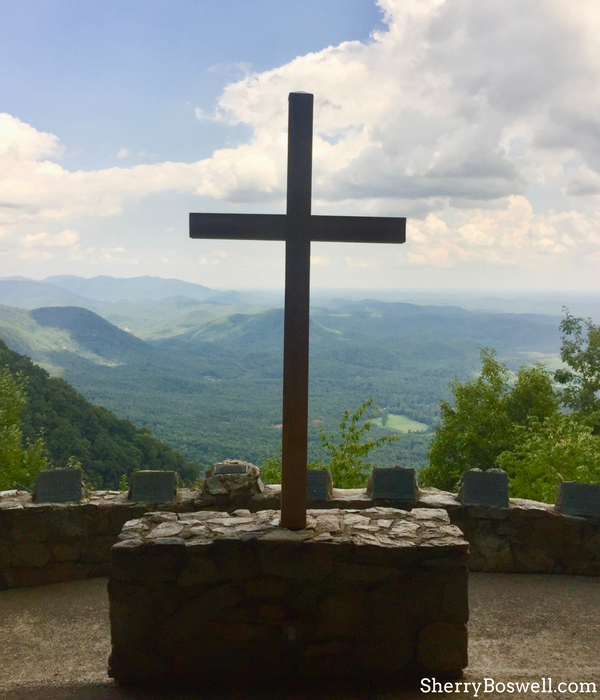 YMCA Camp Greenville has the most appropriately nicknamed chapel possibly in the world: Pretty Place lives up to its moniker. Photo by Sherry Boswell, TravelingMom with Teens. A private university nestled in Greenville County, Furman University has one of the most picturesque campuses in the area if not the entire Southeast. Most noteworthy is the Bell Tower on Furman Lake, also known as Swan Lake. “Music by the Lake” on Thursdays at twilight features a Lakeside Concert Band in the summer. Come enjoy the cross-section of musical genres like Big Band, Jazz, Bluegrass, Contemporary, Marches, and Orchestral favorites. Looking for other family-friendly activities? Check out these 14 Best Things to Do in Greenville with Kids and Best free fun in the Southeast.